Belly dancing: An Oriental stereotype or source of rehabilitation for women? If you ask anyone in Turkey about belly dancers, one of the first things they would recall are the television programs featured on New Year's Eve or the "gazinos;" a type of night club where belly dancers appear before and after musicians. Turkish celebrity magazines and TV channels show wealthy men throwing money on the floor or sticking money onto a dancer's body while she dances, which has even become a humorous tradition. It was not until the 1980s that belly dancers started to make frequent appearances on TV across Turkey. Nesrin Topkapı, adorned in a black costume, was a young belly dancer back in those days, and put on a dance performance at Turkey's state-run broadcasting network TRT, making a name for herself as the first belly dancer to appear on television. Her name is still remembered today but only a handful of her fellow performers have gained fame since then. Even some aspiring dancers have changed their career and went on to become well-known singers. Unfortunately, I may be setting the stage for belly dancers in support of a stereotype that is also common in other regions of the world. In any case though, belly dancing in Turkey is primarily about entertaining people; notably men. Some belly dancers have entered the spotlight for their love affairs with famous celebrities. They may even accept the swirling rumors that what they do is solely a form of entertainment and seduction. Yet, what history tells us about belly dancing is a lot more different than we could imagine. Belly dancing is a widely debated topic. Some people think it originated in Turkey, while some believe it started in Egypt or India. Surprisingly, this unique dance comes from all three of these countries. As one of the most ancient dance forms, you could say that belly dancing is Egyptian, ancient Orient, Arabic or Middle Eastern since it has been cultivated for centuries by different regions. Some historical accounts say that traditional belly dancing began in fertility rituals and goddess worshipping ceremonies, performed by women to improve fertility and agility in childbirth. This possibility is likely because today's pregnant women are sometimes advised to practice belly dancing to strengthen her pelvic muscles for childbirth. In some Egyptian weddings, the bride and groom take photos with their hands on the belly dancer's stomach - a clear reference to fertility cults. In Northern Africa, young women perform the belly dance to collect coins in the marketplace. These coins are sewn onto their clothes as part of a dowry. Belly dancing was also widely performed during the Ottoman Empire. 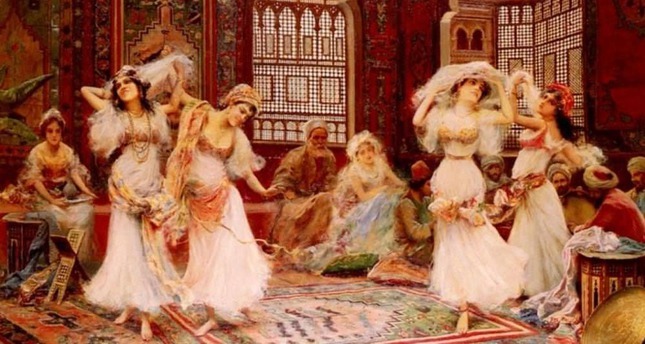 In the imperial harems, women used to dance for sultanas as well as sultans. America is said to have been introduced to belly dancing at the 1893 World Columbian Exposition in Chicago. A dancer known by her stage name "Little Egypt" gave the first performance of Middle Eastern belly dancing to Americans. Prior to the exposition, travelers from all over the country were already mesmerized by the performances of belly dancers at all-male meetings. An even more widely debated topic is regarding the official term for belly dancing. It is said that the term "belly dance" comes from a French word "danse du ventre," meaning "dance of the stomach." It is called "cifte telli" in Greece and "raks sharki" in Egypt. In Turkey, belly dance is either referred to as "rakkas" or "göbek dansı," the latter of which is the literal translation of belly dance in English. In short, there is no correct term for the belly dance, which has evolved and changed over thousands of years. Also, the music these performers dance to can vary. Audience members may hear Egyptian and Middle Eastern pop during a performance, as well as Saudi rhythms and Hindi music while a belly dancer appears in her "bedleh," a costume featuring a two-piece, decorated bra and skirt set. Sometimes, separate sleeves, gloves, a veil and a head dress accompany the costume. If you are looking for a place to purchase a traditional belly dancer costume, Istanbul's famous Grand Bazaar is the perfect place to discover numerous glimmering varieties. Each graceful undulation is an expression of femininity and strength. This would be what you hear from a belly dance trainer. A study at Western Michigan University revealed that the U.S. is incidentally known to have the highest number of belly dancers worldwide, including those of the Middle and Near East. There are also other studies stressing that white, middle-class American women practice belly dancing as a source of feminine identity and empowerment. It is interesting that belly dancing is also preferred for its therapeutic aspects and is performed among women who suffer from physical illness, injury or psychological diseases. Regardless of the purpose it serves, belly dancing appears to blur the lines between a stereotype and female empowerment.